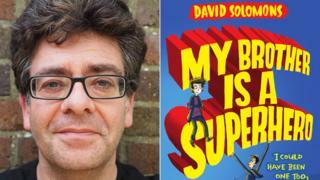 Screenwriter David Solomons has won the Waterstones Children's Book Prize with his debut about an 11-year-old boy obsessed with comics. My Brother is a Superhero is focused on Luke - named after Solomons' own son - whose brother Zack is given special powers to help save two universes. Winning Solomons £5,000, the book sees Luke miss out on the powers because he went to the toilet at the wrong time. Solomons previously adapted E Nesbit's Five Children and It for the 2004 film. Eddie Izzard and Kenneth Branagh both appeared in the big screen version. The winners of the best illustrated book and best older fiction categories were also first-time authors. David Litchfield's The Bear and the Piano was named the best illustrated book, while writer and actress Lisa Williamson's The Art of Being Normal won in the best older fiction category. Solomons had been named as the winner of the best younger fiction book before being named as the overall winner of the prize, voted for by booksellers, at a ceremony at Waterstones' Piccadilly bookshop in London. Waterstones children's buyer Florentyna Martin said: "My Brother is a Superhero is that rare thing - a hugely funny book for young readers that is also rip-roaringly exciting. "It is infused with the spirit of larger than life heroes and colourful comic book trivia that enthrals younger readers and delights superhero fans of all ages, yet at its heart is a touching relationship between siblings. "Given the author's background it's no surprise it is hugely cinematic, but it is also full of wonderful writing and so brilliantly plotted that one never knows what to expect next." The book chain's managing director James Daunt added: "The quality of the books on the shortlists this year was exceptional, reflecting the vibrant health of the children's book market. "That our winners were all first books, and each from a flourishing independent publisher, reflects how blessed we are currently by the breadth of creative talent in this country." Litchfield's book is about a bear who teaches himself to play the piano, while Williamson's is focused on LGBT issues and tells the story of two teenagers and their struggle with identity.